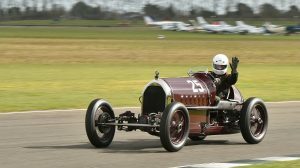 The 76th Members’ Meeting will celebrate the pioneering spirit of the Shelsley Walsh and Brooklands ‘specials’ builders with an eclectic grid of pre- and post-war vintage specials in the inaugural Bolster Cup, taking place on Sunday March 18. The Bolster Cup will make its Goodwood debut at the 76th Members’ Meeting and will provide an irresistible David vs Goliath contest, as thundering Bentley, Delage and aero-engined specials take on spritely GNs, Morgans and Austins. The race takes its name from brothers John and Richard Bolster, who epitomised the spirit of the irrepressible and relentlessly resourceful pre-war specials builders. Their first car ‘Bloody Mary’, built while the brothers were still in school, was created in order to “drive around a field as dangerously as possible”. At a later stage in its hillclimbing career ‘Bloody Mary’ boasted some 200bhp at the back axle in a car weighing roughly 230kg, consequently John Bolster enjoyed some notable successes. While Richard Bolster sadly died serving in the RAF during WW2, John went on to become a well-loved journalist and broadcaster, and a founding member of Autosport magazine. ‘Bloody Mary’ will be present at the Members’ Meeting for those that wish to marvel at its concept, while another of Richard’s Specials – the Richard Bolster Special – will take its place on the grid to celebrate the heritage of the Bolster name. With a vast array of shapes and sizes in action the Bolster Cup will honour the legacy – well preserved today by the Vintage Sports Car Club – of the imaginative Shelsley Walsh engineers and is expected to be one of the highlights of the 76th Members’ Meeting. Tickets to the 76th Members’ Meeting are available to Goodwood Road Racing Club Members and to members of Goodwood Fellowship. Act quickly as weekend and Saturday tickets are selling fast and are now limited.